The VITA Mission is ESA astronaut Paolo Nespoli’s third mission aboard the International Space Station, commencing 28 July. VITA stands for Vitality, Innovation, Technology and Ability. This was chosen by Italian space agency ASI, which is providing the mission through a barter agreement with NASA. In Italian, ‘vita’ means ‘life’, reflecting the experiments that Paolo will run and the philosophical notion of living in outer space – one of the most inhospitable places for humans. 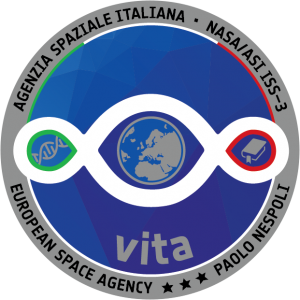 The mission’s logo was developed by ESA together with ASI and Paolo. The overall circle and blue shading evoke our planet, with the Third Paradise symbol by Italian artist Michelangelo Pistoletto linking the mission’s main messages. Three elements stand out: a strand of DNA as a symbol of life and science, a book as a symbol of culture and education, and Earth as a symbol of humanity. The Third Paradise is a reformulation of the symbol for infinity. The two opposing ovals contain elements of the scientific and cultural activities Paolo will perform in space. Their meeting in the centre represents the evolution of Earth and benefits for humankind. The central shape of the symbol, together with the presence of the globe, can also be seen as an eye, giving an astronaut’s perspective over our planet. Reflecting Paolo’s origins, the logo features the colours of the Italian flag.